"Canyoneer" redirects here. For the album by No Trigger, see Canyoneer (album). Canyoning (canyoneering in the United States, kloofing in South Africa) is travelling in canyons using a variety of techniques that may include other outdoor activities such as walking, scrambling, climbing, jumping, abseiling (rappelling), and swimming. Although non-technical descents such as hiking down a canyon (canyon hiking) are often referred to as canyoneering, the terms canyoning and canyoneering are more often associated with technical descents — those that require abseils (rappels) and ropework, technical climbing or down-climbing, technical jumps, and/or technical swims. Canyoning is frequently done in remote and rugged settings and often requires navigational, route-finding, and other wilderness travel skills. Canyons that are ideal for canyoning are often cut into the bedrock stone, forming narrow gorges with numerous drops, beautifully sculpted walls, and sometimes spectacular waterfalls. Most canyons are cut into limestone, sandstone, granite, or basalt, though other rock types are found. Canyons can be very easy or extremely difficult, though emphasis in the sport is usually on aesthetics and fun rather than pure difficulty. A wide variety of canyoning routes are found throughout the world, and canyoning is enjoyed by people of all ages and skill levels. Canyoning gear includes climbing hardware, static or semi-static ropes, helmets, wetsuits, and specially designed shoes, packs, and rope bags. While canyoneers have used and adapted climbing, hiking, and river running gear for years, more and more specialized gear is invented and manufactured as canyoning popularity increases. In Japan (sawanobori) and Taiwan canyoning is called river tracing and typically involves traveling upstream. Canyoning in the UK has gained in popularity over recent years. In the UK, Wales, Scotland, Cumbria and Yorkshire and some areas of Cornwall are recognized as the prime locations to try out this activity. In the Welsh language canyoning is called "cerdded ceunant". It has been described as slightly different from its American counterpart; however the activity involves all the traditional methods but in a different climate and location. Most experts who visit Wales for this activity often refer to it as "Gorge Walking", but the main concept remains the same. The UK Scout Association defines "gorge walking" as "the activity of following a river bed through a gorge. This often includes climbing, swimming, abseiling and scrambling depending upon the environment". Canyoning in Ticino, Switzerland also named the eldorado for canyoning is one of a kind because of its authentic granite rock, crystal green pools and its pleasant mediterranean climate. This region has been popular throughout the whole story of canyoning, back in the days of the pioneers, but only the last few years is gaining an enormous popularity amongst more experienced canyoneers. In the United States, descending mountain canyons with flowing water is sometimes referred to as canyoning, although the term "canyoneering" is more common. Most canyoneering in the United States occurs in the many slot canyons carved in the sandstone found throughout the Colorado Plateau. Outside of the Colorado Plateau, numerous canyoneering opportunities are found in the San Gabriel, Sierra Nevada, Cascade, and Rocky Mountain ranges. 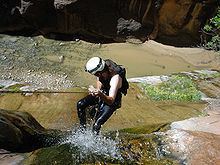 Canyoning is common in Australia in the sandstone canyons of the Blue Mountains National Park, known for their technical abseil starts and lack of fast flowing water. Canyoning can be dangerous. Escape via the sides of a canyon is often impossible, and completion of the descent is the only possibility. Due to the remoteness and inaccessibility of many canyons, rescue can be impossible for several hours or several days. Canyons with significant water flow may be treacherous and require special ropework techniques for safe travel. Hydraulics, undercurrents, and sieves (or strainers) occur in flowing canyons and can trap or pin and drown a canyoneer. A 1993 accident in Zion National Park, Utah, USA, in which two leaders of a youth group drowned in powerful canyon hydraulics (and the lawsuit which followed) brought notoriety to the sport. A potential danger of many canyoning trips is a flash flood. A canyon "flashes" when a large amount of precipitation falls in the drainage, and water levels in the canyon rise quickly as the runoff rushes down the canyon. In canyons that drain large areas, the rainfall could be many kilometers away from the canyoners, completely unbeknown to them. A calm or even dry canyon can quickly become a violent torrent due to a severe thunderstorm in the vicinity. Fatalities have occurred as a result of flash floods; in one widely publicized 1999 incident, 21 tourists on a commercial canyoning adventure trip drowned in Saxetenbach Gorge, Switzerland. Authorities in Switzerland have set in the last few years high standards on safety, "Safety in adventures" label is becoming the standard for all companies to prove they are following the standard safety procedures. Temperature-related illnesses are also canyoning hazards. In arid desert canyons, heat exhaustion can occur if proper hydration levels are not maintained and adequate steps are not taken to avoid the intense rays of the sun. Hypothermia can be a serious danger in any canyon that contains water, during any time of the year. Wetsuits and drysuits can mitigate this danger to a large degree, but when people miscalculate the amount of water protection they will need, dangerous and sometimes fatal situations can occur. Hypothermia due to inadequate cold water protection is cited as a cause of a 2005 incident in which two college students drowned in a remote Utah canyon. Canyoning via packraft in the U.S. southwest deserts. Narrow slot canyons, especially those narrower than humans, present difficult obstacles for canyoners. 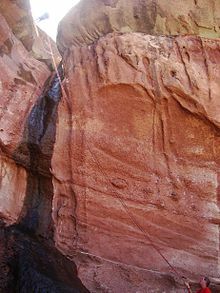 At times a canyoner is forced to climb up (using chimneying or off-width climbing techniques) to a height where one can comfortably maneuver laterally with pressure on both walls of the canyon. This tends to be strenuous and can require climbing high above the canyon floor, unprotected, for long periods of time. Failure to complete the required moves could result in being trapped in a canyon where rescue is extremely difficult. Past rescues have required extensive rigging systems and dishsoap to extract stuck canyoners. Narrow sandstone slot canyons tend to have abrasive walls which rip clothing and gear, and can cause painful skin abrasion as a canyoner moves or slides along them. Immersion in water may lead to exposure to diseases such as Weil's Disease (Leptospirosis), dermatitis and gastroenteritis. Ingestion of water should be avoided and taking a shower immediately after canyoning or gorge walking is recommended. Canyons are changing environments and falling rocks, including chockstones, are not uncommon. A moving chockstone caused Aron Ralston's 2003 accident where he was forced to amputate his forearm. Many canyons are located in remote areas with limited or sparse trails, and due to their harsh environments, straying from established areas can be dangerous. As the sport of canyoneering begins to grow, there are more and more people looking to learn the skills needed to safely descend canyons. There are several reputable organizations that are now offering classes of various forms to the public; some organizations are training organizations that offer certifications, while other commercial operations offer classes in addition to purely recreational guided tours. The latter is particularly popular in tourist destinations around the world, such as Costa Rica, Hawaii, the Philippines, and Utah. Most programs have multiple levels of skill-set classes. The lowest levels usually cover the basics such as rappelling, rope work, navigation, identification of gear and clothing, and rappel setups. The higher levels cover more complex situations such as anchor building and strategies on how to descend various types of canyons. Other higher level and specialty classes typically cover rescue situations, wilderness first aid, and swift water canyons. ^ Staff, Guardian (2007-09-28). "Gorge Scrambling". The Guardian. Retrieved March 14, 2018. ^ Michael R. Kelsey (July 2008). Technical Slot Canyon Guide to the Colorado Plateau. ISBN 978-0944510-23-0. ^ "Canyoneering for Beginners: What to Know Before You Go". 2012-07-16. ^ "Overseas visitors". OZultimate.com. Retrieved February 13, 2018. ^ "Australia's remote slot canyons". ^ Paul Lashmar and Imre Karacs (1999-07-28). "Swiss river disaster: Black wall of water swept down the gorge, crushing everyone in its path". The Independent.uk. Retrieved March 14, 2018. ^ Jessica Dacey. "Adventure sports safer ten years after tragedy". Swissinfo.ch. Retrieved March 14, 2018. ^ "Trip turns deadly for 2 BYU hikers". Salt Lake Tribune. ^ Pat Reavy. "Ropes and dish soap free woman wedged in slot canyon for 12 hours". KSL.com. Retrieved March 14, 2018. ^ Aron Ralston (2011-02-03). Between a Rock and a Hard Place. ISBN 9781849835091. ^ "Canyoner's death preventable, expert says". ABC. 2010-01-15. Retrieved March 14, 2018. ^ Black, David (2013). Canyoneering: A Guide to Techniques for Wet and Dry Canyons (2 ed.). Guilford, CT: Falcon Guides. p. 193. ISBN 978-0-7627-4519-7. 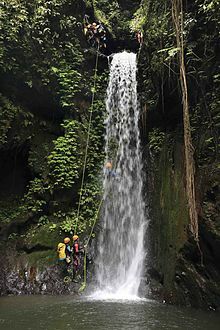 Wikimedia Commons has media related to Canyoning.